SEBRING, Fla. - On a perfect day for racing at Sebring International Raceway, Corvette Racing ran a perfect race. 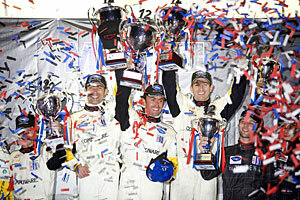 America's premier production sports car team scored its fifth GT1 class win in six years in America's classic endurance race, the Mobil 1 Twelve Hours of Sebring. Oliver Gavin, Olivier Beretta and Max Papis drove their No. 4 Compuware Corvette C6.R to a 17.863-second victory over their Corvette Racing teammates Johnny O'Connell, Ron Fellows and Jan Magnussen in the No. 3 Compuware Corvette C6.R. The Corvettes ran like clockwork throughout the grueling 12-hour race, completing 341 laps around the 3.7-mile, 17-turn circuit. Both cars made 12 routine pit stops for fuel and four Michelin tires after 55-minute stints, and then made their final stops with five minutes remaining for a splash of gas. "The Corvette C6.R was a joy to drive all day, and there wasn't a single thing that went wrong," said Gavin, who drove the victorious Corvette to the checkered flag. "The team performed fantastically, and there wasn't one misstep on any of the pit stops." "To finish with less than 20 seconds between the two cars after 12 hours of racing is quite remarkable," Gavin noted. "You can't get a stronger test than 12 hours at Sebring, and we've come through with flying colors." After two days of downpours, race day began with a sunrise surprise as Corvette Racing unveiled the No. 3 Compuware Corvette in brilliant Arctic White paint, a salute to the limited edition Ron Fellows ALMS GT1 Champion Corvette Z06. The race began under clear skies with cool 60-degree temperatures. Fellows and Gavin started the 12-hour enduro in the No. 3 and No. 4 Corvettes respectively, with Fellows taking the point in the GT1 class when the green flag fell. The two cars held first and second in the class standings through the first two pit stops and driver changes. After 2 hours and 40 minutes of racing, Gavin took the lead following the third round of pit stops. "We had a great battle with the No. 3 Corvette, and I think the turning point was when I was able to get through traffic and gain some distance when I came in for my pit stop," Papis reported. "Then with Gavin's out-lap, it made just enough difference for us to get around the No. 3 car." "After that it was continuous perfect pit work by the mechanics and great strategy by our engineer, Steve Cole," Papis continued. "There is a lot of pressure when you have one of the best crews and three of the best drivers in the world on the other side, but my guys never missed a beat. This is the first win since my Dad passed away in December, and I know that he guided us today." "Our Corvette was fast, strong, and fantastically reliable," added Beretta, who scored his record-setting 29th career ALMS victory. "Everything went very smoothly in the race. I stayed out of traffic and stayed off the curbs." The drivers and crew of the No. 3 Corvette were quick to congratulate their winning teammates. "You can't say enough about how Corvette Racing prepares their cars - both cars were very strong, and this was a good test for the 24 Hours of Le Mans," said O'Connell, who was aiming for a record seventh class win in Sebring. "I'll try for No. 7 next year. I want to get that record, and I know in a Corvette I'll be able to do it."